We've all heard that squealing sound associated with stepping on the brake pedal... It means that it's time to service the brake system. Brake pads have a built in "squealer tab" that is designed to drive us crazy until we finally take our cars into the shop for a brake service. As the brake pads wear down over time, the squealer tab gets closer to the surface of the disc or drum. Eventually, the pads wear down far enough for the squealer tab to come into contact with the spinning surface. This metal-on-metal contact creates that wonderful, high-pitched sound we all love. In all seriousness, it is never a good idea to drive for extended periods of time with brakes squealing. Once you get used to ignoring the sound, you'll forget about it, and your brake pads will eventually wear down completely! Once the pads are gone, the metal-on-metal grinding begins. Not only is this dangerous, but it will cause serious damage to your discs or drums, and will end up costing you more to repair in the long run! To spot problems early, your brake system should be checked at the intervals recommended by your manufacturer. We'll perform a thorough inspection of your brake fluid and components to and identify any immediate needs, plus we'll let you know if we spot anything that could need repair in the near future. Brake rotors and drums wear down over time and need to resurfaced during each brake pad replacement. This helps extend the life of your rotors or drums, and keeps your vehicle stopping safely. 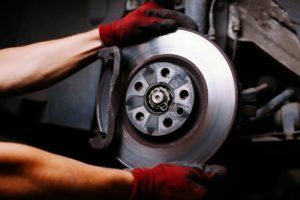 The brake system is one of the most important pieces of safety equipment on a vehicle, and it is often forgotten about. Let us handle your regular brake service and we'll make sure you're stopping safely out there.